As much as I recognize the lure of the idea boards on both Pinterest and Houzz, I've been a little reluctant to delve into the latest trend in social media. Not that I'm dragging my feet, because it is a bit of work. But I finally decided to take the plunge. 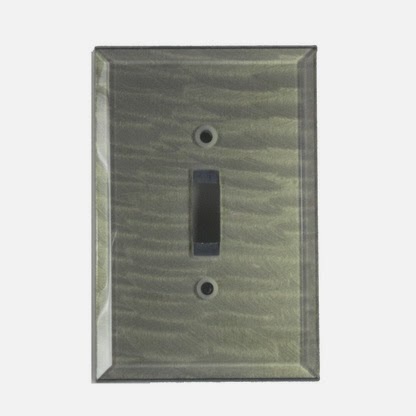 Our glass switch plates were the motivator that prompted me to create my first idea board on Houzz. Since glass tile walls and backsplashes are the latest fashion rave in kitchen and bath decor, customers often want our help in choosing glass switch and outlet covers. So I started with a google image search for tiles that are compatible with our deep opal decora plate. I refer to our deep opal as a decorator color because it works so beautifully with modern color schemes. One of my favorites, it's best described as slate with a bluish greenish tint. Amazed at how many beautiul glass tiles are in the marketplace, I had to narrow my focus and chose the mosaics for this blog. Although the exercise was a challenge, it was time well spent, as I found I was building my repetoire and now feel more educated on glass tiles and manufacturers. Needless to say this won't be my one and only shot at creating an idea board. Hot on my agenda for 2013, I imagine my next one may be about choosing knobs and pulls for princess girl bedrooms or matching drapery finials and fabrics...wow the possibilities are mind boggling!